Th is product consists of a transmitter and a receiver , the transmitter and receiver connected through a CAT5e/6e LAN cable . The transmitter is connected to the HDMI and USB output of the computer host, and it is sent to the receiver via the LAN cable to restore the signal s . The HDMI signal is used to connect the monitor, USB is used to connect the U -disk , camera and other USB external device s , and the receiver can also connect the keyboard mouse with USB port. Support EDID pass though, best compliant with different display devices. In the same time, this extender can support infrared control signal pass through. 4.Support EDID pass through via LAN, for best compliance with most display devices. We are not just manufactory for HDMI products, we are also provide HDMI application resolution for customer. Small orders are also welcome, but the unit price is also difference from wholesale price. 4. How long can be ready about the goods 9 It usually takes about 30 working days,it is based on the detailed QTY. Each input source has 1 UTP extension loop output, make it easy to view and control the source at monitoring room which can be 60 meters away from source. At the same time there is a UTP extension console output, with this extension port, the manager is able to switch and view all the 4 input sources in his office which also can be 60 meters away from the source. 7. Support extension distance up to 60M over 1080P@60Hz. we will try our best to put your ideas into effect and send you finished files for confirmation. Q: What's' your After-sale service9 A: All products have pass strict inspection before they go out. Belong to the product quality problem, provide free repair within one year. The transmitting unit is used to capture the HDMI input with IR signals and carries the signals via one cost effective Cat5e/6 cable. 7. Allows HDMI Audio/Video and IR signals to be transmitted over a single Cat5e/6 cable. 8.Transmission Range: Extends 1080p resolution up to 164ft/50m over a single Cat5e or Cat6 cable. 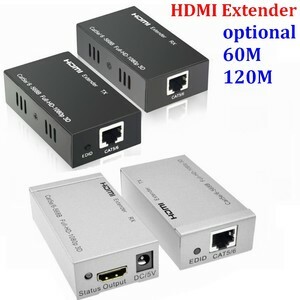 Alibaba.com offers 1,726 rj45 hdmi extender products. About 76% of these are other home audio & video equipment, 10% are fiber optic equipment, and 1% are kvm switches. 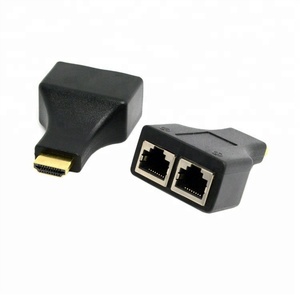 A wide variety of rj45 hdmi extender options are available to you, such as paid samples, free samples. 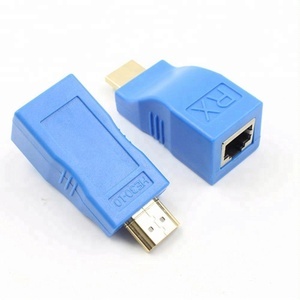 There are 1,726 rj45 hdmi extender suppliers, mainly located in Asia. 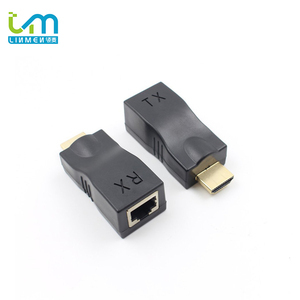 The top supplying country is China (Mainland), which supply 100% of rj45 hdmi extender respectively. 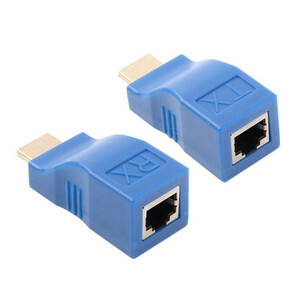 Rj45 hdmi extender products are most popular in North America, Eastern Europe, and Domestic Market. You can ensure product safety by selecting from certified suppliers, including 318 with ISO9001, 218 with Other, and 5 with ISO14001 certification.